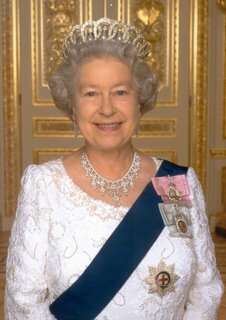 Yup, Her Majesty is celebrating her 80th Birthday. I don’t really have much to say about it, I just figured I would mention it. I’ve always been a fan of the monarchy, although I think is has more to do with a fascination for the gowns and glitter than for the job itself. Either way, I think the Queen has managed to hold on to a tough job with poise and dignity for a really long time. Having said all that, I honestly don’t know the lady very well. Oh, sure, we’ve had tea together a few times, and there was that time in ’99 that I lent her five bucks, because she ‘forgot her purse at the palace’, but beyond that, we’re not all that close. When I was a kid and had to clean the bathroom, I used to imagine that the Queen was going to stop by. It was on those days that I actually scrubbed all the nooks and crannies I could find…until I got bored and switched to pretending I was a TV commercial and I’d try to sell myself some shampoo instead. Once in a while, I’d imagine the Queen stopped by and I would try to sell her some shampoo. It never occured to me that she might not be in the market for 1/2 a bottle of Pert Plus. Maybe I should have sent her some for her birthday. It’s got to make a better gift than the two black beavers Canada gave her once. At least shampoo is practical. What was my country thinking? ?